Former patients of a controversial Winnipeg-based stem-cell research company are growing increasingly frustrated by what they say is a lack of action by Canadian authorities. "I cannot believe that the authorities in Canada have not taken this seriously. These people are playing with human lives," Julia Browning, a former multiple sclerosis patient and supporter of Doug Broeska, head of Regenetek Inc., wrote in an email to CBC News. The trial therapy initially worked so well for Browning, she helped Broeska recruit more patients. She then started hearing that the same treatment failed for some of her friends. Since then, Browning and others have been questioning Broeska's qualifications, his research methodology and the stem-cell treatment in India. The RCMP and Health Canada are investigating complaints against Broeska made by some of those former patients. The University of Manitoba has confirmed it is looking into whether Dr. Susan Hauch, one of its family medicine faculty members, was involved in a controversial international stem-cell clinical trial run by Regenetek. It's contrary to ethical guidelines for patients to pay to be part of a clinical trial in Canada and India. Patients have also complained to the College of Physicians and Surgeons of Manitoba about Hauch, who is named in government and court documents as a Regenetek director and a related company, The CliniCard Inc.
About 70 multiple sclerosis patients were recruited by Regenetek to get combination stem cell therapy. It involves widening the veins of the neck, then injecting the person's own stem cells inside. Patients have paid up to $45,000 US. 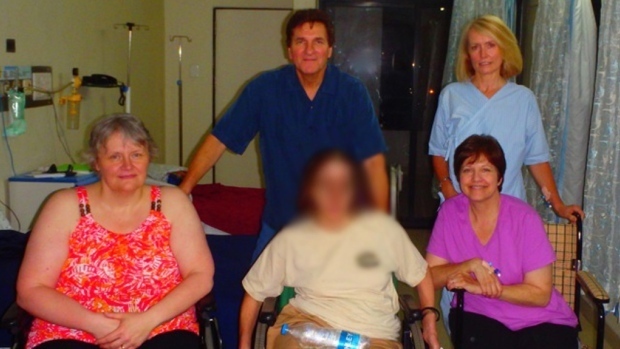 MS patient Lee Chuckry, of Airdrie, Alta, first complained to authorities when he returned from his treatment in India in 2013, and again earlier this year. "I received the CTP treatments in May 2013 and almost immediately realized that the treatment did not work on me. There were so many issues with the hospital, Regenetek and Doug Broeska that I had to relate my negative experience in a blog that I wrote," Chuckry wrote in an email to CBC News. "The purpose behind my blog was to inform prospective patients of what they could expect from the hospital and treatments so people could make an informed decision on whether or not to have the treatment and spend an enormous amount of money. I felt ripped off and wanted to save others from the same experience. "I have been promised by the RCMP that this case is being investigated very seriously. However, I now have extreme doubts about this claim. Neither the RCMP or Health Canada are able to tell me anything regarding my complaint, hence, I don't think anything is really being done," Chuckry wrote. A spokesperson for the RCMP in Manitoba confirmed the case is still under active investigation, but Sgt. Bert Paquet said there are no new updates. "These types of cases are complex and take time to investigate. While we understand the frustration expressed by some of the former patients, we owe it to the victims to investigate this matter thoroughly," Paquet said. The University of Manitoba's research ethics committee is working on a report, which will then work its way through a research council and board of governors, said spokesperson John Danakas. In the meantime, Browning has started a Facebook page to publicize her frustrations. On it, former patients are posting their mostly-negative opinions about Regenetek and the Indian-based research group doing the treatments. "I am trying to fight this for all of them. I will not let it die," Browning told CBC News. n a LinkedIn profile, Broeska claimed to have a PhD from the University of Manitoba. The university says that's not true. Broeska has produced a PhD certificate from Brightland University as proof of his qualifications. That university is unaccredited in the United States and United Kingdom, and the University of Manitoba confirms it would not recognize a degree obtained from there. Broeska previously issued a statement saying he's been "unfairly accused and victimized." He said he welcomes the investigations and looks forward to the truth coming out and vindicating him. Broeska has also sued a former employee, alleging she stole confidential patient and research documents. "The potential medical benefits of stem cell research are immense and will continue to advance despite the ongoing malicious suppression tactics employed by the global pharmaceutical industry and its vast network of financially dependent confederates including individuals paid to sabotage research trials and report misinformation to the media. "Despite these significant obstacles, Regenetek Research remains steadfastly committed to submitting its data for publication in recognized medical journals for peer-review despite the insidious and self-serving actions of special interests that seek to thwart credible stem cell research and malign those involved in conducting it. "Regenetek intends to shortly release the first in a series of articles based upon the research that was legally and appropriately performed in oversight accredited studies by neuroscientists, neurosurgeons, neuroradiologists, clinicians and other scientists during the years between 2011 and 2015.